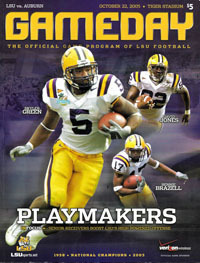 Every issue of the Golden Football Magazine contains an article on LSU football. All articles are archived. Use the links at the right to read past articles. Skyler Green graced the cover of the Auburn program - fittingly as it turned out. Skyler Green sets sail for EZ. Kenny Irons eludes Chase Pittman. Dwayne Bowe cradles TD pass. John Vaughn reacts after missing FG in Q3. Anthony Mix celebrates his TD. 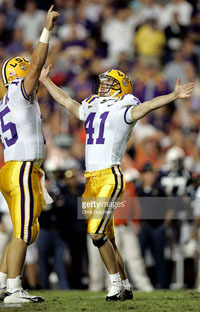 Holder Matt Flynn and kicker Chris Jackson (41) celebrate tying FG. Vaughn and holder Patrick Lee after missing OT FG. 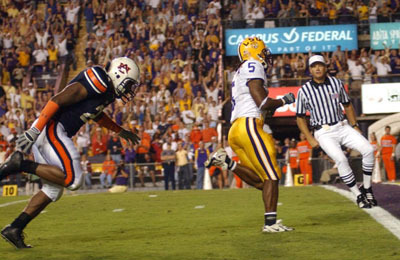 The LSU-Auburn rivalry had produced more named games than any other in the last 17 years. 1988 - "The Earthquake Game": When Tommy Hodson connected with Ed­die Fuller in the EZ on 4th down to take a 7-6 lead with 1:41 left, the crowd generated a rumble that registered across campus on the Geology Depart­ment's seismograph. 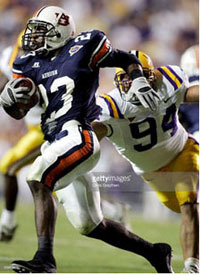 1994 - "The Interception Game": LSU's defense held Auburn's offense to a single second-half first down. But the Plainsmen intercepted five Jamie Howard passes in Q4, returning three for TDs in a 30-26 win. 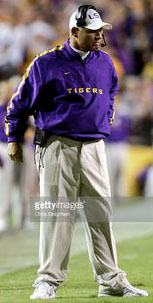 1995 - "Bring Back the Magic Game": Gerry DiNardo promised to "bring back the magic" to Tiger Stadium after six straight losing seasons. His Tigers knocked off #5 Auburn 12-6 in Gerry's first home game. Troy Twillie pre­served the win by knocking down a pass in the EZ as time expired. 1996 - "The Night the Barn Burned": The Student Activities Building (known as "The Barn") across the street from Jordan-Hare Stadium caught fire dur­ing the game but no one left. Supposedly, the conflagration was started by an ember from a visiting fan's grill. LSU S Raion Hill returned an INT for a TD and took the potential tying two-point conversion pass the other way with 0:38 left to seal the 19-15 triumph. 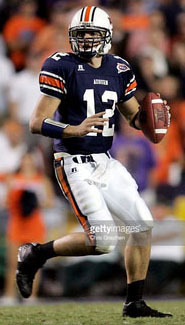 1997 - "The Comeback": Auburn QB Dameyune Craig led a 10-play, 80y TD drive in the last minutes for a 31-28 victory. 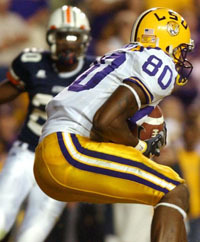 The game was the coming out party for LSU TB Cecil Collins, who ran for 235y. 1999 - "The Cigar Game": The Alabama Tigers started DiNardo's downfall with an embarrassing 41-7 rout. Auburn players smoked cigars at midfield afterwards while coach Tommy Tuberville smirked. 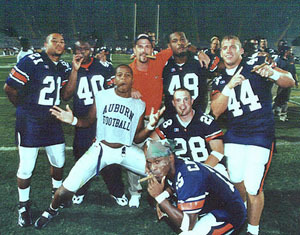 Auburn players smoke cigars on the field after smoking LSU in 1999. 2001 - "The Band Is on the Field! Game": The game was postponed to the end of the season because of 9/11. 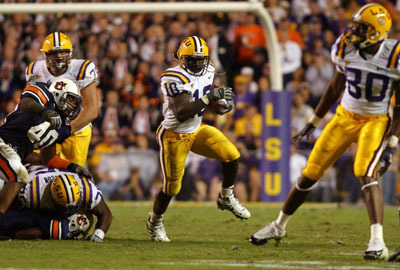 LSU needed a victory to cop the SEC West title. 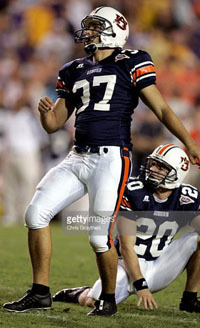 Auburn was penalized 15y to start the game because they stomped on the Eye of the Tiger at midfield. So Nick Saban ordered an onside kick that LSU recovered to start the 27-14 triumph. At halftime, the Auburn kicker, Damon Duval, warmed up before the Golden Band from Tigerland finished its performance and didn't move out of the way as the band marched off to the South end. That led to a minor skirmish between the kicker and some band members. Duval didn't make another FG that night. Thousands of Tiger fans lit cigars as the final minutes ticked down, creating a haze that hung above the stadium for a while after the game ended. 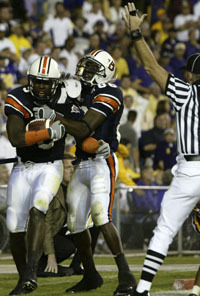 2004 - "The Call": Auburn scored a TD with 1:14 on the clock to tie the game. John Vaughn missed the PAT, but Ronnie Prude was penalized for jumping up to try to block the kick and landing on the snapper. Given a second chance, Vaughn succeeded. That proved to be the only time that penalty was called in college football that season, and the rule was changed in the offseason. The winner of the Clash of the Tigers had played in the SEC Championship Game four of the last five years. 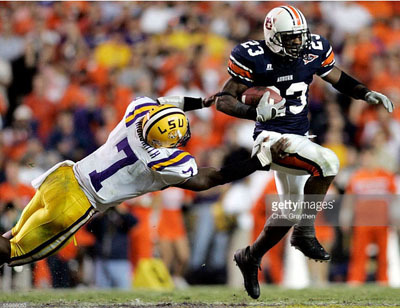 Auburn went undefeated in 2004, a season that ended with the Tigers be­ing left out of the BCS Championship Game a year after LSU beat Oklahoma in the final contest. Williams: Beating them here 31-7 (in 2003) was good. Last year was just bad. That probably sticks out more than anything, just how bad a taste that left in everybody's mouth. It seems like it put everybody in a funk for the rest of the season. 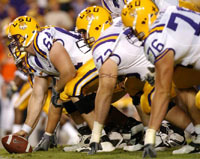 The game was a must win for LSU because of their loss to Tennessee. An Auburn defeat meant the Plainsmen no longer controlled their own destiny and needed someone to beat LSU down the stretch. The talk all week in Baton Rouge was LSU's need to cut down turnovers and penalties. The Tigers came off an ugly win over Florida 21-17 despite committing all five of the game's turnovers and being penalized 11 times for 84y. Coach Les Miles insisted his team worked hard all week to avoid a repeat. Offensive coordinator Jimbo Fisher, who took responsibility for the delay of game penalties, wanted his offense to show more consistency. His QB, Ja­Marcus Russell, didn't want to play tentatively because of past mistakes. Once you think about it too much, then you're in that zone, stuck on that par­ticular play. You can't just play offense; you're always worred about "what if" so you've got to just get it behind you. Once it's done, go on to the next play. Defensive coordinator Bo Pellini, whose 2003 Nebraska unit set a school record with 32 interceptions and led the nation in turnover margin, stressed takeaways during preason practice. But LSU ranked 109th in the nation in turnover margin in 2005. 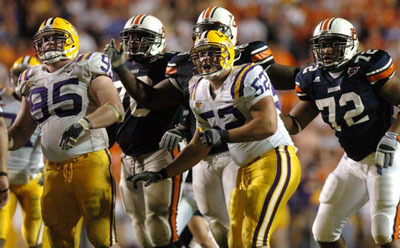 #16 Auburn showed no fear in facing #7 LSU. The Alabama Tigers had won 10 of their last 14 meetings with Top 10 teams, including four straight. Auburn had won five straight after an opening loss to Georgia Tech, a game in which the Plainsmen lost five turnovers and committed 11 penal­ties. In the subsequent games, Tommy Tuberville's team had lost the ball just four times and been penalized only 25 times. Auburn led the SEC in scoring offense and total offense while LSU's D had allowed only 60 ypg rushing the last three games. Another strength vs strength area was kickoffs, where Auburn led the league in returns while LSU was No. 1 in covering kickoffs. You never know about this game, said Tuberville. The atmosphere is always great. Both groups of fans expect a good game. 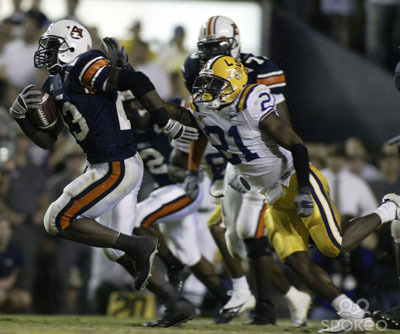 Even before I got to Auburn, there were some real good games between Auburn and LSU. I think it will be well-played on both sides. Southpaw QB Brandon Cox, a sophomore, looked forward to playing in Tiger Stadium for the first time. We have a lot to prove to people. There's no better place to do it than on the road at LSU. If we win this game, we have it in our hands. As long as we keep winning games, we'll be able to defend our title. Because of the shortage of hotel rooms in Baton Rouge after Hurricane Katrina, Auburn spent Friday night in a hotel in Montgomery and traveled on game day for the first time in memory. A Tiger Stadium record crowd of 92,664 and the ESPN audience saw a career-best performance by a visiting RB on a cool evening. Q1: Auburn took the kickoff and drove straight down the field thanks largely to a 26y pass from Cox to WR Anthony Mix for a first down at the LSU 32. 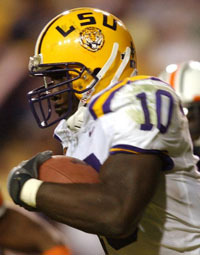 The drive reached the 20 before a blitz sacked Cox to extend LSU's streak of registering a sack to 43 games. Pressure on the next play forced an ugly completion. That brought on John Vaughn, whose 41y try sailed wide right with 8:52 remaining. It would not be Vaughn's only miss of the evening. LSU recorded one first down before having to punt. 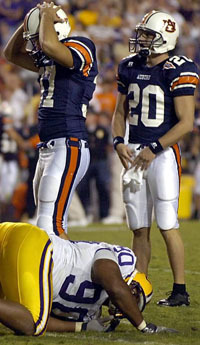 Despite the gift of an offside penalty on LSU, Auburn went three-and-out to bring on punter Kody Bliss. Florida had consciously punted away from Sky­ler Green, one of the most exciting players in college football. Would the Plainsmen do the same? Earlier in the week, Miles and Green were chatting after practice. Les told Skyler that he did not expect Auburn to kick near Green. But the four-year veteran of SEC play disagreed. This is Auburn. They have too much pride not to kick to me. He would prove to be right on. Skyler Green completes his punt return TD. 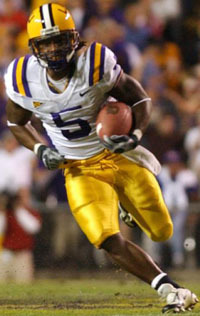 The TD return was the fourth of Green's career and marked the seventh different way LSU had scored a TD during the season. The other six were pass, run, INT return, fumble return, blocked FG return, and blocked punt return. Mixing runs by TB Kenny Irons with short passes, Auburn gained two first downs and moved one yard across midfield before Ronnie Prude deflected a 3rd down pass attempt. This time Bliss rugby punted out-of-bounds on the 18. Kenny Irons eludes Ali Highsmith. The LSU offense finally generated some momentum. Starting from the 20, the Tigers ripped off three first downs aided by a defensive holding penalty on 3rd-and-2. 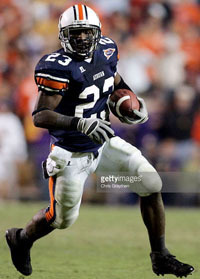 JaMarcus Russell took the short throws the defense gave him, hitting Green for 8, Craig Davis for 8, Green again for 9, and RB Jo­seph Addai for 11 to gain a first down at the Auburn 27. But an incompletion set up Jackson for a 38y FG that he missed to the left with the clock show­ing 6:42. Miles revealed after the game that Russell played "with a little bit of a dinged hand." Afterward, JaMarcus said: It felt great in warm-ups and it felt good during the game, but I guess the ball was coming out different. A lot of the players said they could see the ball coming out differently. After three futile downs, Auburn bravely punted to Green. Skyler muffed the ball but fortunately fell on it for a loss 1 at the LSU 33. The defenses held sway and, after an exchange of punts, LSU took over at its 4 following a 63y rocket by Bliss that sailed over Green's head. Staying on the ground, the Tigers pushed out to a first down at the 31. But the old bugaboo, penalties, struck. Two false start infractions forced a punt, and Auburn ran out the clock. Which offense would awake first? Q3: If LSU fans expected immediate positive results from Russell & Compa­ny after the halftime break, they were disappointed. Three-and-out. 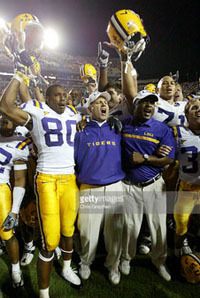 The blue-shirted Tigers pushed far enough for a long FG try as Cox fired completions to Aromashodu for 10 and Jake Slaughter for 19 to the LSU 27. But a sack, an incompletion, and another sack set up a 54y FG attempt that fell short. With fine field position at their 37, the Tigers could gain only 3 and punted to the 26. Kenny Irons breaks back Chevis Jackson on his 74y TD run. Q4: On 3rd-and-7 from the 11, Russell fired to Bowe in the EZ. Dwayne slid to take the low throw in his chest, but it bounced away. So David trotted out for an easy 28y FG but missed wide right. Bowe on his dropped TD pass: I had to get it out of the way early. Every great player drops a touchdown pass. I'm just happy I got minue out of the way early. That will be the last one guaranteed. Auburn cranked up another drive thanks to a 3rd-down completion to Courtney Taylor for 11 and successive Irons' rushes for 10 and 36. But the machine broke down at the 20. Amazingly, Vaughn missed again, wide left from the 37 with 11:21 to go. Jackson: If you mess up, you have to wipe your slate clean and try to do the best the next time you go out there. I knew the offense was going to put me in a position to score. With no timeouts left, Auburn edged forward on a 19y completion to Mix, who stepped out on the AU 38. Three snaps later, Irons ran 19y to the LSU 36 where CB Jonathan Zenon and S LaRon Landry ran him out of bounds with less than a minute left. A pass to Taylor gained only 4 and kept the clock running when Prude made the stop inbounds. Cox spiked the ball to stop the clock with seven seconds left. Surely the law of averages would prevent Vaughn from missing his fourth attempt of the evening. But Lady Luck turned her back on him again. His 49y boot sailed wide left as Miles tried to call timeout. With 0:01 on the clock, Russell threw a Hail Mary that was broken up. LSU fans prayed this extra session would work out better than the one in the 30-27 OT loss to Tennessee September 26. OT: Auburn won the toss and chose defense. As usual, LSU elected to play toward the student section in the North endzone. The Plainsmen started with a 2y run by Irons, who finished with a personal best 218y on 27 carries. But two Cox incompletions gave Vaughn a chance to redeem himself. Sitting in the upper deck in the southwest corner of the stadium, I didn't have a good angle on his kick from the left hashmark but expected the fans in the South endzone to let me know the result before the officials. As the boot traveled into the north wind - ever so slowly it seemed - I waited, waited, waited. Why aren't they cheering or moaning? Finally, the ball hit high off the left upright and bounced away. 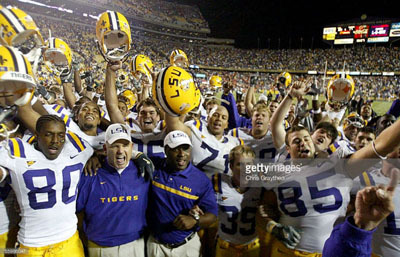 The Tiger Stadium mystique had struck again! Five missed FGs! Vaughn: About three of the kicks tonight, when I hit them, I thought they were good. I got a little unlucky and they went right or left. The last one, I thought I hit it pretty good, and when I looked up, I knew I was probably going to need a little bit of luck right here. 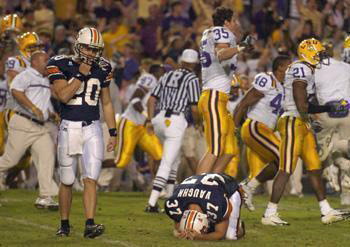 Both sets of Tigers watch the final FG try; Vaughn in despair after ball hits upright. Miles: We played well on defense and played well enough on offense to win. We didn't have any turnovers and were not penalized severely (5 for 30y). We improved and played well enough to win on special tams. ... We beat a good team, maybe the best of all teams that we've faced. ... Irons is a good back, and that offensive line is a very physical group. They played extremely well. On the effect of Bowe's dropped ball and the missed FGs: The key is that no matter to what extent we played close to our opponent, we still found a way to win ... I was glad to see Chris Jackson come in there and kick it to win it. I was glad to see our defense step up and stop them. I thought Jo­seph Addai rushed the ball extremely hard (106y on 24 rushes). Bowe explained his feelings when Vaughn missed the kick in OT: It was a relief to me. If I had caught that touchdown pass, I could have sealed the victory. When that kicker missed it, I almost cried. I'm just glad we came out with a victory. Tuberville: We played a good football game; we just came out a little bit short. Our defense played hard. We just didn't do anything with our kicking game. It let us down at time. That's my fault. We must not have worked enough on it, but we will work on it. On his team's offensive performance: We hung in there. That is the best defense we have played, and we moved the ball. We had oppor­tunities. We just didn't take advantage. ... We fought the crowd noise. I thought that our guys hung in there mentaly, and that's what it's all about on the road. We just came up a little short. Cox: Loud crowd. I couldn't hear out there. ... They came out and blitzed almost every play. We moved the ball great, offensively we had a lot of yards (451 to 339 for LSU), but we just stalled whenever we got near the goal line. We just couldn't punch it in. Irons: The crowd noise affected us. We fought, everybody fought. ... We can't blame it on one person. Everybody made mistakes. We just have to keep our heads up and get ready for next week. ... The offensive line did a gresat job. Running behind those guys is easy. I am already in the secondary because they block so well. Reports from Alabama said that John Vaughn home was egged after the game. "The Year of the Extra Point"
Why Didn't He Go to Florida? 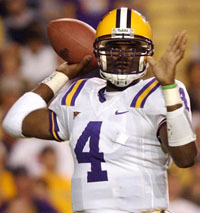 "LSU is not a class team"
But Did He Beat Tulane? "Give Them My Regards in Baton Rouge"
"Football Is Strictly an Afternoon Game"
Terry Bradshaw: "I know how it all got started."